Remember when I said that routing the HDD cables is hard with this case? This is an example of what I was talking about. I can just imagine what running three IDE cables through that wee little groove would be like. You can’t run the cable through the duct area since the plastic scoop on the case side actually fits down into the duct. Here’s a look at how a completed (OK, mostly complete, no CPU or HSF but you get the idea) rig looks when you’re finished. The window is quite good for showing off the pretty, shiny, fancy PC living inside your case. The "Tower of Power" looks vaguely like something you’d see floating in space in a Kubrick flick. I really love that look. Even without the door in place the TJ09 looks pretty nice with a bit of work. Overall it’s a very impressive case that has a lot of promise. There are a few shortcomings but I think it’s awesome overall. The installed system consists of an Abit AN8 Fatal1ty motherboard, AMD 3200+ at 2.4Ghz, EVGA 7950GT, 2 X 512Mb of Geil PC3200 nF4 series ram, a WD400 Western Digital 40 Gig 7200Rpm HDD, Samsung DVD-ROM, Ultra X-Pro 600W PSU and a Turtle Beach Montego DDL sound card. During testing in a 26°C room I was seeing 32° case temps, 38°C CPU idle temps, 42°C load CPU temps and 53°C GPU idle temps and 63°C load GPU temps. The case temps stayed pretty steady during idle and load testing. For idle testing I surfed the web for an hour taking note of the temps with Rivatuner and CoreTemp. For load I ran CoD2 for an hour and enabled logging in both of my temperature monitoring apps. I used SpeedFan to monitor the case temps. I’ve since migrated my ASUS A8N32-SLI Deluxe with SLI 7950GT video cards into the TJ09 and I’m getting 46°C on the CPU (X2 3800+) under load and 63°C on card 1 and 56°C on card 2 under gaming load. I mentioned earlier the mesh over the intake. Out of curiosity I removed it and saw slight decrease under load on the CPU to the tune of 2°C but on the GPU’s I saw an increase of 13°C on card 1 and 15°C on card 2! I’m attributing this to the design of the EVGA HSF. It puts the fan at the rear of the card near the PCI slot covers and the air exits at the end towards the front of the case. The increased airflow from removing the mesh resulted in the heated air from the GPU heat sinks being blown back towards the fan on cards and recycling through the HSF. On a card with the fan towards the front of the case I don’t think you’d experience the same phenomenon. The SilverStone TJ09 is one of the most serious enthusiast cases on the market today. It has cooling options aplenty and features several innovations such as the front fan duct designed to aid in GPU cooling, vertically cooled HDD’s and ultra thick materials used throughout the construction of the chassis. The fit and finish are second to none although the anodizing suffers the curse of all anodized cases, I cannot fault SilverStone for that though. You deal with that on any anodized case. I’m not crazy about the situation with the HDD cables but given the design of the front cooling there’s really not much way around that flaw. If you’re expecting a fly-weight case look elsewhere. The TJ09 tips the scales at 24.2 pounds, nearly as much as a similarly sized steel case but it’s as strong or stronger than many steel cases on the market today thanks to the monster construction. 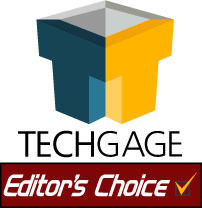 Overall I’m awarding the TJ09 a 9/10 and our coveted Editor’s Choice award and my advice to you is that if you’re in the market for a new case and can afford an E-ticket give the TJ09 a hard look. Keep an eye on our forums because in the coming weeks I’ll be modding the TJ09 to accept water cooling with an internal 240 rad and I’ll be posting a worklog so you can see what’s involved.